Eight years old was one of the best years of my life. I was the oldest of my siblings (authority!) and I had just begun homeschooling. That meant I could read anything I wanted (within the checkout limits at our local library) while my mother taught my little brother the basics. All the same, I loved it when she read aloud to all of us in the mornings, and I couldn't get enough of animal stories. I adored Jim Kjelgaard's Big Red, Wilson Rawls' Where the Red Fern Grows and anything Marguerite Henry. I'd beg and beg for just one more chapter, and it wasn't uncommon for my mother to accede and read until her voice grew hoarse. 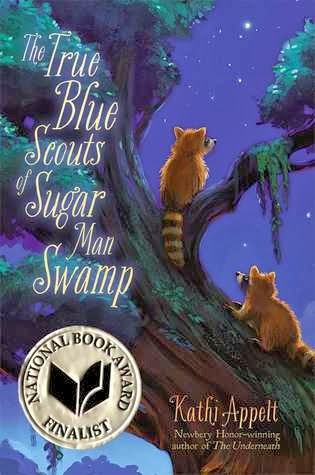 I know my eight-year-old self would have loved Kathi Appelt's The True Blue Scouts of Sugar Man Swamp. Newbery Honoree and National Book Award finalist Kathi Appelt’s story of care and conservation has received five starred reviews, was selected as a National Book Award finalist, and is funny as all get out and ripe for reading aloud. Raccoon brothers J’miah and Bingo are official Sugar Man Swamp Scouts, and they know their duty: to be alert for trouble and to wake the legendary Sugar Man in case of emergencies. Never mind that no one has seen him for nearly 60 years! Nearby, 12 year-old (human) Chap Brayburn is mourning the death of his beloved grandfather Audie, and trying to figure out how to be the man of the house. When trouble comes to the swamp, J’miah, Bingo and Chap must each use all of their ingenuity and courage to save it, and themselves. J'miah and Bingo are raccoons, and raccoons are known for mischief. However, these brothers have just been inducted as Official Scouts of the Sugar Man Swamp, and with that appointment comes responsibility. They've got to listen to the Voice of Information, watch out for trouble, and most of all, be true to each other. Their antics are by turns hilarious and heartwarming, and in the end the number of crawdads, dewberries and sugar pies they have eaten amount to an adventure all its own. Appelt writes human emotion with just as much laughter and verve as the animal action, but with an extra dose of poignancy. Chap's attempts to step into his grandfather's shoes are a little bit funny, a little bit doomed, and all the way sincere. Chap's story could stumble into maudlin or contrived territory, but it doesn't - the author keeps just the right balance. The fantastical element is included in a natural, organic way, so that the book rides somewhere between tall tale and a 'book about talking animals,' and makes you want to (for just a little while) visit the magical place that is the Sugar Man Swamp. Right then Chap pulled the neck of his T-shirt out and looked down at his chest. Not a single hair. Didn’t he need a few chest hairs to be a man? With that, he filled Audie’s mug, right up to the brim. “You might want to put some cream and sugar in that,” his mom said. Grandpa Audie had never used cream and sugar, had he? “Blacker ’n dirt.” That’s the way he had always drunk it. That was the way Chap would drink it too. He raised his grandpa’s mug to his lips and took a tiny sip. It was hot hot hot. It was bitter bitter bitter. All at once, he understood how coffee would make the pies taste better. The sweet of the pies would offset the hot and bitter. The True Blue Scouts is a funny, beautifully written and environmentally friendly tale of familial love and the ways in which a specific spot in nature can become ‘home’ to the heart. J’miah, Bingo and Chap explore the swamp and discover some of its dangerous and wondrous secrets, and each tries to protect it in his own way. I would imagine that it's especially charming when read aloud, so that the animal and human voices really come alive. Recommended for: fans of Kate DiCamillo, those who enjoy animal stories on the order of Charlotte's Web or The Adventures of a South Pole Pig, and readers ages 8 and up who enjoy their stories with a light fantasy element. Fine print: I received a finished copy of this book from the publisher (Simon & Schuster) for honest review. I won't be picking this one up as I'm not overly fond of books about just talking animals but that sounds like such a delicious read! I love that coffee quote! I too like my coffee dark and unsweetened -- with or without the pie. My niece and nephews would have loved this book when they were young. I also loved this book, though since I am not a true foodie I didn't think of it quite the way you do. But to be honest, I really could have gone for one of those Paradise Pies. I also listened to this book on CD read by Lyle Lovett at someone's recommendation and if ever a book and reader were made for each other, these two are it. He was the perfect reader and I found myself laughing out loud. I borrowed it from the public library, so if you are ever looking for an audiobook, you might consider it.